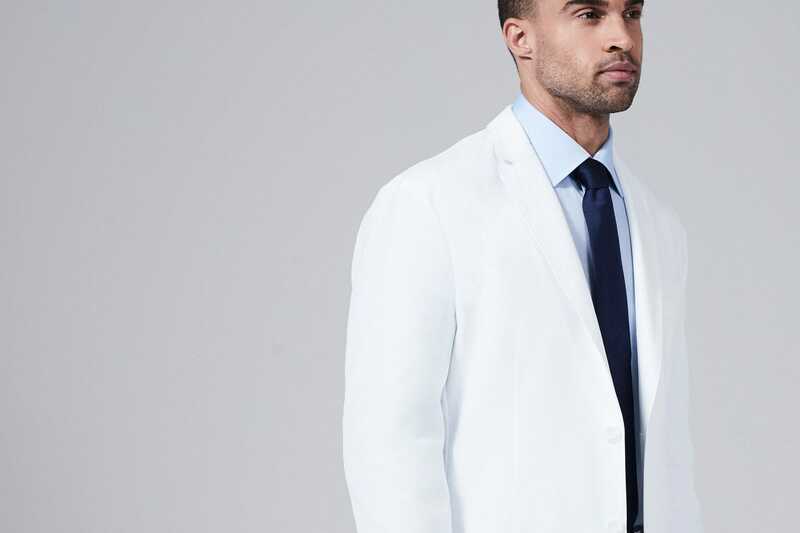 A men's lab coat that exceeds its potential for quality and class. E. Wilson's look and feel of a tailored blazer is supported by design ergonomics that ensure ease of movement. A handsome notched lapel with top stitching throughout. 2 welt pockets can fit iPads, 1 chest welt pocket and 1 interior. 2" longer than its cousin, the H. W. Cushing. Double back vents and tailoring through the arms and torso allows for a full range of motion. This lab jacket is not only practical and easy to care for, but it is the professional standard with respect to appearance. We’ve spent years on research and development testing a proprietary technology on the fabric interior to keep you cool, dry and comfortable, with a fabric exterior that repels fluid, soil, and stains. Our lab coats for men have the highest possible rating in the industry when tested for strength, soil release, and fluid repellency, which is why we proudly back up our warranty for a full year. Allow us the opportunity to display your name and title - embroidered with prestige and perfection - in the manner you've earned. Our in-house service allows us to provide exemplary service to our customers and colleagues. We go to great lengths to ensure that each custom lab coat, scrub top, and scrub jacket is perfectly sewn, inspected, and packaged. We are committed to working with you until you are 100% satisfied with your embroidery. Featuring a European double back vent and sophisticated thinner lapel, the E. Wilson lab coat is consistent with today's modern blazers and suits. Overall the E. Wilson is narrower than Laennec in the shoulders and torso, yet comfortable, ergonomic and functional. superior Performance and durability, and sophisticated styles for both men and women. We have spent over 2 years in research & development testing the ultimate lab coat fabric worthy of the professionals who wear it. Featuring proprietary technology on the fabric interior to keep you cool, dry and comfortable and a cutting-edge finish on the fabric exterior to repel fluid, soil, and stains. Featuring less than 1% shrinkage after first wash. Also, no pilling after 100 washes, and the highest rating in the industry when tested for strength, soil release, and fluid repellency. All features work for the lifetime of the garment. A technology that dramatically improves stain release during laundering. We use high denured, small silk-like yarns for a soft hand with a brushed finish. A performance fabric that is engineered to be lighter and more durable than cotton. Repel fluids with nanotechnology that creates a fluid barrier on the outside of the fabric. Prevents odors from trapping in the garment & virtually neutralizes order-causing bacteria. Breathable fabric keeps you cool where it matters most. Dries 4 times faster than cotton, reducing time and energy required for laundering. Pulls sweat and moisture away from your skin and pushes it into the air. C6-based sustainable PFOA-free repellence protection. Bright white - The look and feel of the fabric reduces color discoloration from perspiration or wear from usage. Resists and releases wrinkling, fading, or pilling. Easy to wear. Pre-treat stains prior to washing. Machine wash warm, regular cycle. Whites only. Do not use chlorine bleach. Non-chlorine bleach is ok. Do not use liquid fabric softener - it will block the moisture wicking fabric feature. Tumble dry medium. Do not use a dryer sheet - it will block the moisture wicking fabric feature. Pull out of the dryer early and fold, or place on a hanger to ensure a smooth, wrinkle-free appearance. Fabric is naturally wrinkle resistant. Low to medium iron as needed, max 300 degrees Fahrenheit. The Closest Thing To Wearing Your Diploma. Allow us the opportunity to display your name and title - embroidered with prestige and perfection - in the manner you've earned. Name & title embroidery is complimentary on orders over $175 and otherwise is $12 per garment. Professional logos and any custom logos may be added at an additional charge and will be sewn into the garment(s) of your choice as pictured, on the right side of your garment. Please contact us or make a note in the 'comments' box if you would like to make additional customizations to size and placement. Please note the partial coverage on longer names (as pictured). A complete guide to coverage can be found in our advice section. We have the utmost pride in our embroidery work. Our in-house service allows us to provide exemplary service to our customers and colleagues. We go to great lengths to ensure that each garment is perfectly sewn, inspected, and packaged. The very first thing that a customer notices is not the stitching or the curved lapels or beautiful pocket detail of the garment itself. It's the embroidery. We call it the "icing on the cake." The "stamp of achievement and great sacrifice." For that reason - it must be perfect. And that is our standard. Name & title embroidery is placed above the pocket, anatomical left, unless requested otherwise. There is limited space on certain sizes & styles, on a properly fitted lab coat, which may result in partial lapel coverage. See character limit chart below. To minimize lapel coverage, use first initials, no periods, and choose only one line of embroidery. Custom embroidery requires 5-10 additional business days, prior to shipping. Embroidered garments may not be exchanged or returned, unless there was an error on our part. When choosing embroidery on scrubs, the first color selection on each scrub top will match the corresponding drawstring color if you choose to purchase scrub pants. We do not offer separate options for drawstring colors on our scrub pants. Medelita custom logo embroidery is the most impressive way to truly distinguish your lab coat or scrubs. A finishing touch like no other - logo embroidery with your office, clinic, or hospital logo turns a lab coat and/or scrubs into something impressive and polished. Logos are sewn directly onto your selected garment. No patches are available. Depending on the logo, your name & title embroidery may be sewn in a color that matches with logo. We digitize/create the art file for new professional logos and school logos free of charge. Otherwise there is a one-time $150 fee for digitzation. This is the process of turning your logo from flat artwork into embroidery detail – color, number of stitches, shading, etc. Additional fees apply. Upload a .JPG, PDF or .DST of your logo. For your convenience, there is an "upload your logo" button in the right hand column, when making your selections for purchase. Once your logo is received, you will receive a confirmation and your design will be digitized by our expert embroidery team. You will then receive a picture (via email) for approval. This initial process takes approximately 5 days. Up to 3 total adjustments/changes can be made, within the $150 original charge. For adjustments beyond three, a $50 additional charge is applicable. Once approved, garments are scheduled for embroidery. We are committed to working with you until you are 100% satisfied with your custom logo embroidery. On properly fitting, gender specific lab coats with stylish lapels, there is limited amount of space in the area above the pocket, and between the lapel and the armhole. Some sizes and styes have less room than others. It is our priority to alert you in advance that Medelita embroidery is centered above the pocket, and embroidered to a standard size/height that is both legible and high-quality in appearance. The large majority of Medelita customers/colleagues are "ok" with some letters of their first name being partially covered by the lapel. For those that want to ensure that every single letter is visible, please adhere to the following guidelines to prevent coverage in both the first and second lines of embroidery. Use the chart below to identify the maximum characters per size in each garment before the lapel will partially cover your embroidered text. Shipping is free both ways in the U.S. Try on your garments on your own time. Keep what you like and send back the rest, or send back what you would like to be embroidered. We will process your embroidery or refund your purchase as soon as possible. Purchases over $100 are automatically eligible for free shipping and returns within the United States (free shipping and returns not available in Alaska, Hawaii, or Puerto Rico - a $5 flat fee applies each way). Prior to specifying embroidery, order two sizes to find your best fit, and take advantage of free return shipping over $100. Let us know which garments to embroider and we'll refund the remaining garments. Simply log into your account, find your order, and print a UPS return label for exchange, refund and/or embroidery. overall the lap coat is amazing. greet and fit, only the lapel is covering my name on the left side, !! Hi Doctor - thank you for your feedback and for supplying us with these pictures. Typically 20 characters would be fine on a size 36 but it looks like maybe the use of capital letters caused the size of the text to expand just enough to be hidden under the lapel. You might try getting the lapel pressed a bit differently so there's more room for the text to display. Let me send this back to our customer experience team to see what can be done here. Thanks. Fashionista locuras? I used to get my doctor coats made to measure overseas in Asia. Medelita beats the fit and finish by a mile. The quality of the fabric has no equal, its weight, the way it falls and drapes. The sewing also is top notch, no comparison to any other doctor coat I have seen. My wife has worked many years in the garment and luxury brand business. She has a sharp eye high quality sewing and can instantly spot a fake Burberry or Hermes. She is impressed by Medelita. The slim Medelita fit is perfect for me. All other coats feel floaty and wobbly. You look sharp, you feel sharp, you project sharp, you act sharp. The material, pockets, cut and look are very high quality and it feels like a very nice coat. More like a dress coat that happens to be a lab coat. Thanks for the feedback Jason - as you can tell, we designed this coat for this purpose....a blend of all the best in performance fabrics with high-end tailoring for a highly professional look. If you like the fit but want to try something slightly more basic, check out the Vert Athletic Fit Lab Coat for men. Let us know what you think! I’ve succumbed to the ER doc tenancies if scrubs and a fleece for the last several years. Decided to return to a more traditional uniform for a change and got this coat. Tons of compliments, everyone thinks I’ve had it tailored. Not the white coat of my youth, for sure. This is my 2nd Medelita lab coat. They finally have figured out how to make stylish, well fitted lab coat for the modern healthcare provider. To the garbage goes those old, baggy, dirty white coats, and in comes high quality craftsmanship, moisture resistant, dirt repelling lab coats. My first coat I’ve had for 2 years, and each time I have it dry cleaned, it comes out looking like the first day I bought it. The quality of the materials used is next to none. These coats fit like a sports coat should, with fitted sleeves, and a tapered mid section. I’m so happy with my purchases. If you desire to look and feel great in what you wear, I highly recommend the Medelita lab coats. Love it. Well-fitted and great quality. Would definitely purchase again. Q: HI I am interested in ordering one of the lab coats but wish to provide embroidery information later. When placing the order can I pay for the embroidery and provide information after conferring with the gift recipient as it is a gift? A: Thank you for your excellent question. If you place the order without embroidery the coat can be sent back to be embroidered. We will automatically charge the card used to make the purchase if there is a balance due, unless specified otherwise. Your gift recipient will not need to pay the balance if they decide to sent it back for embroidery. Q: Hello. I would like to know the tissue/material used. What is the composition of the tissue? Polyester? Cotton? What about the percetual of each? 65% Polyester 35% Cotton? What is the name of the tissue? Gabardine? Oxford? Thanks! A: Thank you for asking out our m3 fabric. We have spent over 2 years in research & development testing the ultimate lab coat fabric worthy of the professionals who wear it. It features proprietary technology on the fabric interior to keep you cool, dry and comfortable and a cutting-edge finish on the fabric exterior to repel fluid, soil, and stains. It also featuring less than 1% shrinkage after first wash. Also, no pilling after 100 washes, and the highest rating in the industry when tested for strength, soil release, and fluid repellency. The fabric is 85% high grade polyester and is blended with comfortable and breathable long-staple cotton. If you have any additional questions regarding our m3 performance fabric please feel free to contact our Customer Service Team at contact.us@medelita.com. Q: Hello, it says that it is possible to get 2 sizes, compare, then send them back and have your preferred size embroidered. How would you do this? I can't find the option. Thank you for reaching out to us with your inquiry. Yes, Medeita provides an easy try on program that provides great flexibility to our customers. A Customer Experience Representative will reach out to you shortly to help explain. Q: What was the tisseu/material used? A: Thank you for asking out our m3 fabric. We have spent over 2 years in research & development testing the ultimate lab coat fabric worthy of the professionals who wear it. It features proprietary technology on the fabric interior to keep you cool, dry and comfortable and a cutting-edge finish on the fabric exterior to repel fluid, soil, and stains. It also featuring less than 1% shrinkage after first wash. Also, no pilling after 100 washes, and the highest rating in the industry when tested for strength, soil release, and fluid repellency. The fabric is 85% high grade polyester and is blended with comfortable and breathable long-staple cotton. If you have any additional questions regarding our m3 performance fabric please feel free to contact our Customer Service Team at contact.us@medelita.com. Thank you for your question. We do offer an excellent discount for our Resident Customer's. Please refer to our coupon page via medelita.com: medelita.com/medelita-coupons.html. If you have any further questions please feel free to contact us at contact.us@medelita.com. Our Customer Service team would be happy to answer any additional questions you might have. A: Thanks for checking back in with us! Unfortunately at this time we still do not provide custom sizes. As you may have been told before, most customers seeking custom sizing will take the closest size to their own tailor to have it done. We recommend this because your tailor will be able to provide the most precise measurements based on a first-hand assessment. I hope that helps! Q: But if i pay more cant you make one for me as the model above but a little bit longer for example a 38 size that is 41-42 long? A: Great question - unfortunately at this time we are unable to provide custom sizes beyond what we currently offer online. There is about 1" room to let out the length, and some have done so using a professional tailor - however, we strongly advise against adding length to anything but the sleeves, as you risk ruining the overall look of the coat - especially if you need to add a patch of fabric. As we grow, we hope to be able to offer many more size combinations for every body type. As always, however, we strongly encourage that you try a couple sizes on at home and determine if the length is truly too short for you before returning the size(s) you don't want, free of charge. I hope that answers your question, and sincerely regret that we cannot offer a custom size at this time. A: Hi, thanks for your question! We often suggest trying the coats on at home without embroidery to see how it looks first - at the moment we don't offer anything finished in a men's slim fit that is quite as long as 40-42.